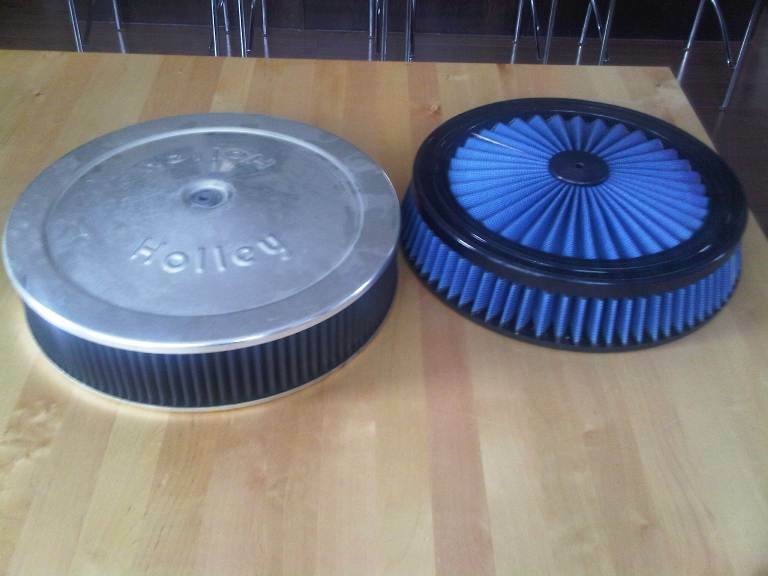 Air Cleaner Assembly - Is this a one off? Ran across this tonight on a car for sale in Europe. I've never seen this style of air cleaner before. Does anyone know if it is a one-off or was this something that was mass produced? I'm considering different setups to complete my new engine rebuild and I thought this was interesting. I think Hall Pantera sold one like that at one time? But I could be wrong? I sure someone will know! It's pictured in Hall's Catalog and current price guide for $275. I thought about it too. It may be in the catalog but I don't believe its been available for quite some time. Great info - thanks. With my new intake, I'm likely going to be above the screen and I just don't like the look of the round air cleaners. I like the look of the dog bone style, but haven't settled on anything yet. The Hall unit looked European enough to be in the running if it was available. Heck, I might even see if I could have one fabricated up myself. This is an interesting air cleaner, does it draw air from the top or the sides where the 45 degree area is and above the stock engine screen ? Instead of having intake air coming from the engine compartment(below the stock screen), what if you could draw air from above screen where it has to be substantially cooler? With all the flat air cleaner elements available for newer cars I'm sure there would be a way to adapt an air cleaner that opened the top of the cleaner up to the area above the stock screen vs. drawing the hot air from below in the engine bay...there has to be an engineer on this forum who can design this. Problem would be if it drew from straight up, if it rained you could have water coming down onto the element, but there should be a way to stop that. Wasn't this called a "Predator"? A friend of mine has one sitting in his house. If someone's interested, I can ask him if its for sale. Dennis I would be interested in knowing as well. Curious if he ever tried it? 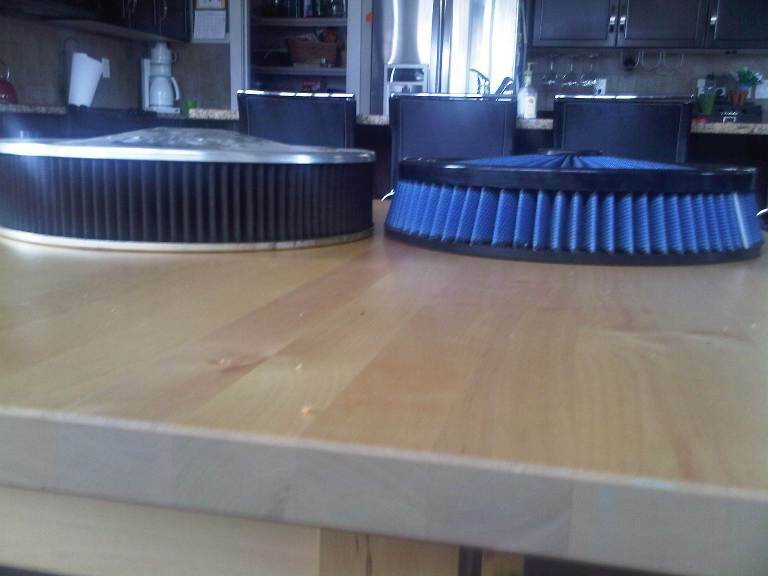 Tom, perhaps the simplest method for drawing air from above a carb is to use one of the several porous tops sold for std round 14" OD air filters. Most are cleanable. No one has tested but I suspect that most if not all the air drawn in by the engine will go through the porous top, making the 'std' air cleaner element below it only along for the ride and requiring rather frequent cleaning of the top filter. I emailed my friend who frequents this forum. He'll be able to verify if this is the air cleaner that he has, answer any questions, and see if he's willing to sell it. Dennis just referred me to this thread and yes, this is a Predator RamTech air cleaner that was originally designed to go on top of their Predator carb but they also market it to fit other carbs with the aluminum hat included(it comes with a natural, not polished, finish). Hall Marketed this for the Pantera in the 1990' and the only difference was the De Tomaso and Pantera script included. I wasn't really looking to sell it but if anybody is interested, I'll sell it for $200 shipped to your door via USPS Priority to CONUS. PM me if interested. I will post pictures so there are no surprises. 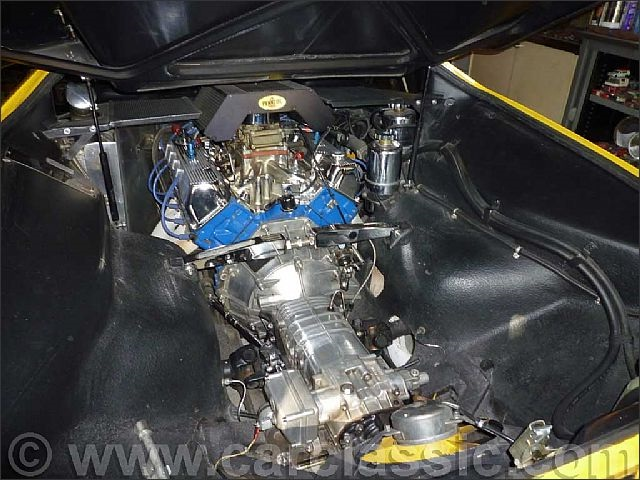 BTW > I've test-fitted it to my engine but it sat about as high as the one pictured on this thread, especially with my Torker intake and I decided to put it back in the box. I also tried the dog bone air cleaner made by B&M but decided against it and ended up selling it to Dennis. I wanted a clean look with the air cleaner under the engine cover so I ended using just an edelbrock Lynx-style air clear and bought an engine cover with a raised section(4 inch) over the air cleaner. I just bought this aFe air cleaner. I liked it because it draws air from the top as well as this sides. You can use the same base and you don't need the top plate. I haven't tried it yet, but it boasts up to a 50 cfm increase in air flow. 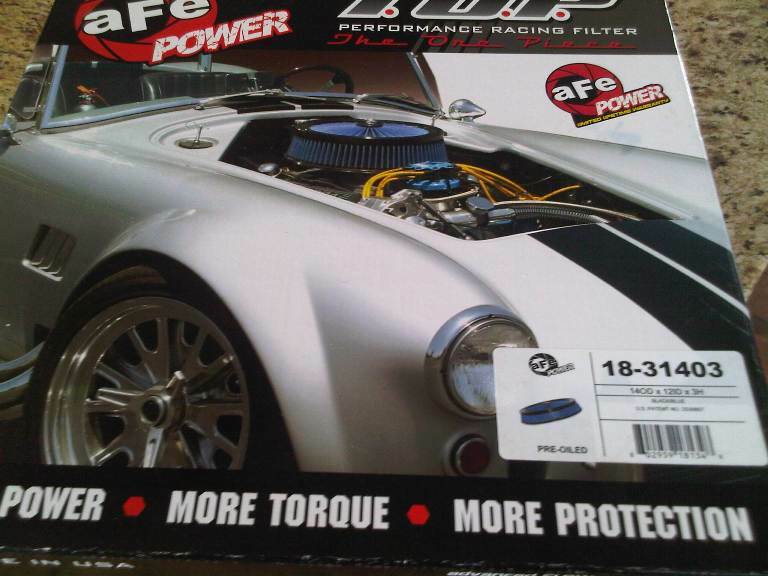 I just bought this aFe air cleaner. That looks interesting, but I can not find it online. Do you have an AFE part #? Should have mentioned that both Summit and Jegs Speed shops stock the porous tops as shown by 3584, at various prices. Note these are paper catalogues. I won't be home until Sunday ... so I'll send the product info then. 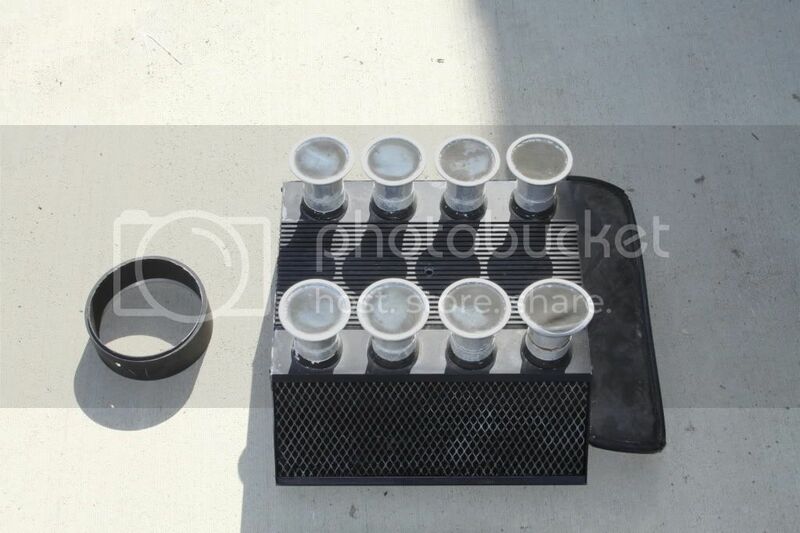 Here's a picture of the Predator RamTech air cleaner my friend has in her collection of parts. Got it off one of the Panteras they bought many years ago and have since sold. It has weber style air horns mounted to the top plate. I guess it didn't float their boat either. Hmm, cosmetic Webers! Yours is stock without the air horns, right? Oh yes, mine looks like the picture on the original post. This one with the air horn was modded. I retired my filter top air cleaner after seeing another one the fuzz burned out of because of a backfire. I'm going to keep a piece of metal up there from now on.